Listen to "The Life of P.T. 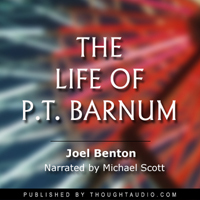 Barnum" on your iOS and Android device. Phineas Taylor Barnum is best remembered for his entertaining acts and for founding the circus that eventually became Ringling Brothers and Barnum and Bailey Circus. Through his entire life, fraught with many failed ventures, Barnum remained a resourceful entrepreneur with a deep conceptual understanding of the use of advertising. This story is filled with entertaining and insightful exploits of his troupe, the towns he visited and the ventures he attempted on the road to becoming "the Greatest Show on Earth". Certainly not a full biography of his life, it does include some interesting stories. His bold way of life was probably rare for his time. I appreciated his understanding of what catches a person's imagination. Of course it was an amazing story of the accomplishment of P.T. Barnum. The store was very well researched and written.